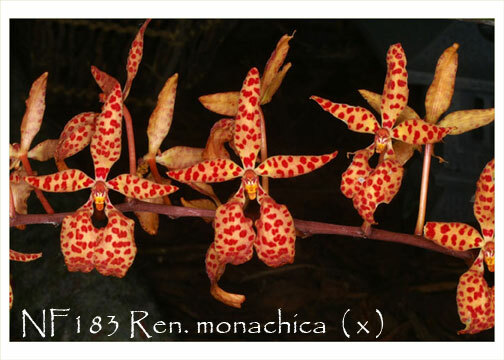 A totally charming miniature Vandaceous species which will reach only 6-8" in height at first flowering. Multitudes of bright golden yellow flowers accented with rusty-red barring are borne on this wonderful and easy-growing compact Renanthera species. Best flowering will be achieved when grown under bright Cattleya or Dendrobium light conditions. Great for a bright windowsill or under lights. Highly Recommended !